Find God’s Good in your Experience! Romans 8:28 – And we know that God causes everything to work together for the good of those who love God and are called according to His purpose for them. 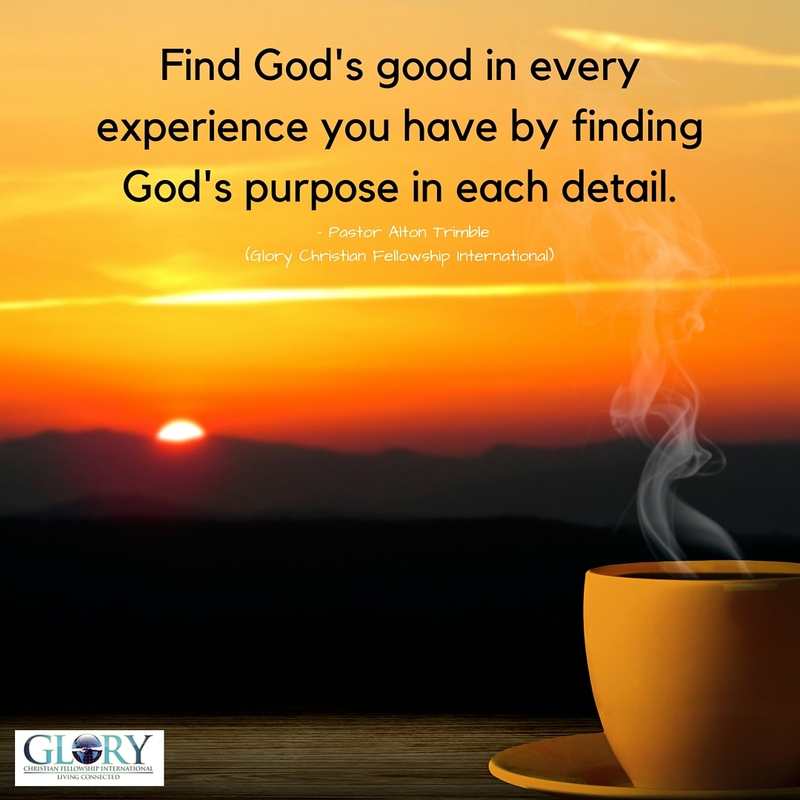 Find God’s good in every experience you have by finding God’s purpose in each detail. Love Is What Love Does! Thank You, O Lord God! I am longing for Your good in my life. Help me to focus on Your way and not my own. In the name of Your Son, Jesus Christ, Amen. I thank you for these experiences and circumstances that I am going through now even though I questioned them in the beginning. Help me, in the beginning, to see the good and your purpose in each detail as it unfolds so that I may walk in your wisdom and not mine. Thank you for YOUR WORD that keeps unfolding, always fresh when I am still. I pray for all the family of GCFI to receive this manna past the 50 days. Again, continue to bless Pastor T. and Sister T. for their great leadership. Thank you God for every good detail and purpose in our life. God we thank you for our church family bless them and they household in Jesus name. I know for certain that You’re constantly working in my life Father. Thank You for that! I’ve Got Seed In The Ground, I Have A Favorable Expectation Of Good In Every Area Of My Life, Because I KNOW That God Is Working Everything Together For My Good And For The Good Of My Entire Family, All Of My Friends. I Am Living Connected.. Thank You Lord for Your Word. Thank You for allowing me to find the good in every situation. I can get caught up in the daily rut, but when I take time to look around I find God in every detail. His goodness is all around us.